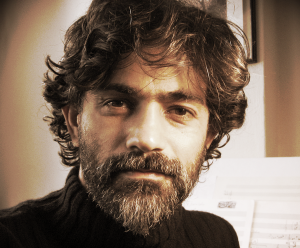 Brazilian composer, Rodrigo Lima was born in Guarulhos São Paulo Brazil (1976). Bachelor in Musical Composition Degree at the Department of Music – University of Brasília and Masters in Composition at the Art Institute of the University of Campinas State (UNICAMP) in São Paulo. His compositions have been released in contemporary music festivals in Brazil, Chile, France, Belgium, Holland, Mexico, EUA and Spain. He has obtained some prizes in National and International Competitions: Composer in residence in 5th International Forum for Young Composers 2008 in Paris (France), Prize International ‘Iberoamericano Rodolfo Halffter 2008 de Composition’ (Mexico), 3ºrd Prize ‘Francisco Guerreiro Martín’ at the ‘XVII Premio Jóvenes Compositores 2006 Fundación Autor-CDMC’ in Madrid (Spain), 1ºst Prize ‘Camargo Guarnieri’ 2005 (Brazil) and Prize for Classical Composition of the National Arts Foundation 2010 (FUNARTE) in Brazil. Limas Music has been performed by the Ensemble Aleph (France), Abstrai Ensemble (Brazil), Camerata de las Amércicas (Mexico), Sonor Ensemble (Spain), Orchestutropica (Lisboa-Portugal), Quinteto Brasília and Camerata Aberta (Brazil). Rodrigo Lima is teacher of composition at the ‘EMESP’- School of Music of São Paulo State and is a member of the General Society of Authors and Editors ‘Sociedade General de Autores y Editores (SGAE)’ in Spain.